The User Interface Module (UI) provides an intuitive, easy-to-use human interface with powerful configuration capabilities to maximize system performance. Door or device mounted UI enables users to safely configure, commission, monitor and troubleshoot the system at the electrical panel without opening the enclosure door, eliminating the possibility of an arc flash incident. System operating parameters can be monitored enterprise-wide through a communications network. Increase uptime by providing data for process management and preventive diagnostics. Run bypass mode greatly reduces internal heating created by the greater power dissipation in the SCRs. Bypass contactors directly connect the motor to the line and improves system efficiency by reducing internal power losses. Internal solid-state overload protection provides accurate current measurement and trip settings. Sophisticated algorithms solve a series of differential equations that model true motor heating and cooling, resulting in superior motor overload protection while minimizing nuisance trips. Advanced selectable protective features safeguard the motor and system against a variety of system faults. 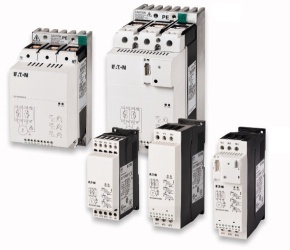 Internal run bypass contactors and overload protection eliminate the need for additional devices, reducing enclosure sizes minimizing installation and wiring time and reducing overall assembly size and cost. Wide range of overload FLA settings (50–100% of rated frame current) and a selectable trip class (5–30) offers users the flexibility to fine tune the starter to match specific application requirements. Variable ramp times and torque control settings provide unlimited starting configurations, allowing for maximum application flexibility. Kick-start feature enables soft starting of high friction loads. Pump control option with sophisticated pump algorithms on both starting and stopping that minimize the pressure surges that cause water hammer. The pump control option will maximize the life of the pump and piping systems while minimizing the downtime caused by system failure. Ranging from 11 to 1000 amps, the S811+ provides an array of built-in features designed to address the needs of industrial and OEM customers.